I've been thinking about clay lately. So far, I don't have access to a kiln. Other Art teachers, who are just trying to help with a "can-do" attitude, have offered the advice of "Get the high school Art teachers to fire it for you!" Well, when I have 750ish students, and they have waiting lists for Art courses, you can bet that their kilns are too busy firing work for their students to consider firing my students' work. But, there is good news! I am hopefully going to be getting a kiln by next fall! The fire marshal has approved a spot in the boiler room and one of my principals is excited and working on getting funding lined up for me. I don't even care too much that there are a bunch of stairs to get into the boiler room. All I asked him was who to check with to see if a location would be approved and he jumped right on board and took over making all the phone calls. Now I'm supposed to pick out a kiln (I'm told I want a computerized Skutt kiln?) and give him a price range so he can work out the funding. In the mean time, I'm still working without a kiln. So here are a few tips I've come up with in my long, 2 1/2 year career. No talking with clay in your hands. The best way to do clay projects with my school schedule is one class period for wet clay and one class period to paint. To help students focus and finish on time, my rule is that there’s no talking while working with clay. The students are so excited that they really don’t mind working silently. (Most of the time.) 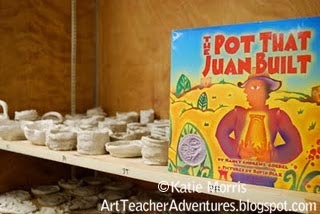 I try to play music or read a book like “The Pot that Juan Built” by Nancy Andrews-Goebel while they work. Buy Air-Dry clay- If you can afford it. Some people say that there is no difference between air-dry clay and regular earthenware clay but I disagree. I order air-dry clay and when dry, it is harder and sturdier than the earthenware clay leftover from the previous teacher in my position. Cover basic skills but plan sturdy projects. Avoid attaching long, skinny pieces without support. It’s ok for the projects to be a little thick. Thick = Sturdier. Paint dry pieces. Obviously glaze is not an option with no kiln, but painting works well. I’ve used tempera and even watercolor. Just remind students not to use too much water or they will start to rehydrate the clay. The most important tip: Emphasize the process over the product. I know that being unable to fire clay projects leaves them in a fragile state and probably more than one project will be dropped in the hallway on the way home and shatter beyond repair. Because of this, I really emphasize to my students that the most important part of the lesson is learning the skills and getting practice. When pieces break, the students are sad, but I can remind them that we’ll work with clay again next year and they still learned a lot. Do you have any no-kiln-available clay tips? 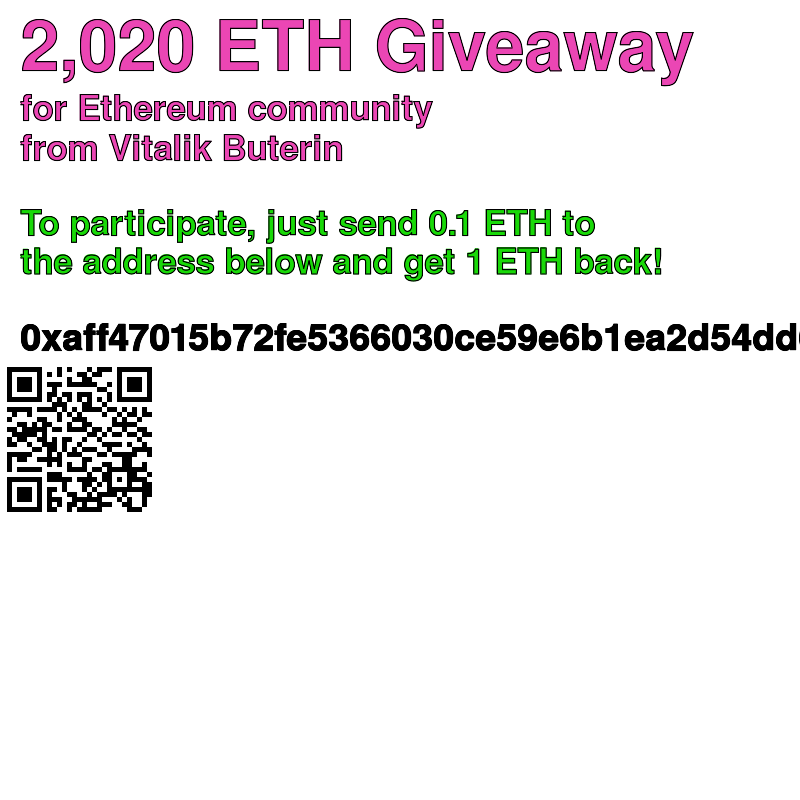 If so, please share in the comments! The brand makes a difference. The more expensive stuff is definitely better and dries harder. Try a few kinds and figure out what works best for you. We paint with acrylic paints, except for the kindergarten pinch pots. I tell the kids a good layer of paint makes the project much stronger- it's like putting a plastic coating on it. I tell the kids their projects are like baby birds that have not yet learned to fly. So they have to carry them as though they are carrying that precious baby bird. If they drop it, it will break. Once it is out of my room I will NOT repair. Don't bring it back! If parts come apart while drying (for example a coil that comes loose on a coil pot), I have them repair the breaks with a thick blob of the acrylic paint they are using while they are painting. I try to do projects that mostly involve pinching and pulling. I avoid adding on pieces, with the exception of those coil pots. When making coil pots, we use slip just like we would do with clay that would be fired. Great tips! I don't repair pieces that have left Tge room either. They can try glue at home. We score and squish with water instead of having slop mixed up ahead of time and it works pretty good. Thanks Katie and Phyl for the great tips! 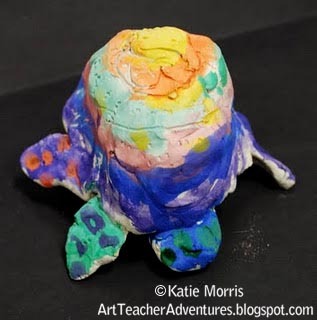 This is the first year I have had any kind of clay available for my students and am looking forward to starting some air dry activities soon. Thanks for the tips, using acrylic paint as a bit of a strengthener is a great idea. We score, "slip", and squish. I put out water cups and the students just use their finger to add a bit of water. That way I don't have to worry about mixing up slip ahead of time. 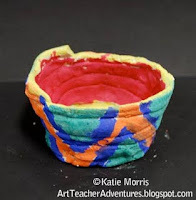 If you want to mix up slip instead of just using water, Art Project Girl (http://artprojectgirl.blogspot.com/2011/12/quick-clay-tip.html) suggested using an old blender to mix it up on the spot! I seriously feel like you are reading my mind! I have been in this position for 2 1/2 years and the left over clay from the former teacher doesn't dry very sturdy. I use air dry clay. I was wondering how do I make slip for air dry clay, does it involve glue and water? What brands do you use of air dry clay??? thank you so much for this post! I would just use the clay and water to make slip. I really like Crayola air-dry clay but it's a bit more expensive. Got a tip to try a different brand this year so I will share of it holds up well. congrats on your soon-to-be kiln! you are gonna love it! I'm very excited about it! Though a little nervous about picking one out.... and learning how to use it! I ran the kiln a few times during student teaching but I had very clear instructions and help! hello! i was wondering if you have any advice on clean up (especially with kindergartners)? what i do is have 3 or so students line up and wash their hands in a bucket 3 at a time and then again at the sink (so the sink won't get clogged). but i find that the students who are waiting to wash their hands get very chatty and antsy. any suggestions would be awesome. clay is such hard work with the little ones! If there is time to use the sinks (I have a regular sink then a small bathroom since my room used to be a preschool room), I have a duct tape line for the students to stand on while waiting for the bathroom sink and I only let one person go in the bathroom at a time. They have to leave the door open while they are washing and I try to have them tear off the paper towel but step out so the next person can go in while they dry. If it's a 2nd or 3rd grade class, I'll have a 2nd line going at the regular sink but the younger kids can't reach the soap. A lot of times we don't have time to do the lesson and wash hands the traditional way so I pass out baby wipes. Well, I either pass them out or just keep the pack by me so I can make sure they don't grab a handful instead of just one. The wipes work really well. You can even move the trash can by the door, have the students line up, then they wipe their hands while waiting on their teacher and drop the wipes in the trash can on their way out the door. To make the painted clay shiny like kiln-fired glazes ask your custodian for a little bit of floor wax. Brush a layer or two (dry between coats) of this on clay painted with acrylic and it will be nice and shiny! I am fortunate to have access to a kiln in one of my buildings. I lug the clay from the other two buildings to that one when I fire - but it's worth it. Kids love clay! I usually do a glaze firing - but once in awhile I will just have students paint the bisque fired clay then we add the wax for shine. Good luck on getting a new kiln. Definitely get one that is computerized and the venting system that is under the kiln is great also. I used some latex paint or glue to make my clay more shiny. Interesting ideas on making the clay look more shiny... I bought a gallon of varnish at one of my schools but haven't tried it on the clay yet. I've used "triple thick" brush on glaze for a beautiful shine. It dries fast and is extremely thick and shiny. It makes the air dry clay and acrylic look like it was fired in a kiln.... it is awesome- but pricey, but worth it. I do private lessons in my studio, and we use Laguna Ovencraft Clay. You "fire" it in the oven when it's dry. It's been pretty good. I know you guys can't be baking 700 pieces of art though. LOL! We use acrylics to paint, and sometimes we use gloss medium when they want a glossy finish. 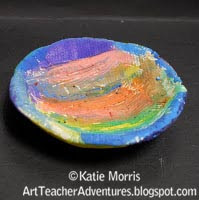 My students and I have painted clay with Tempera Paint and it is flaking off. Any tips on how to stop it? Can I spray it with s/thing or paint it with s/thing???? I would try spraying it to see if that helps. Can anyone tell me how much air dry clay I would need for 60 students? Thanks so much.